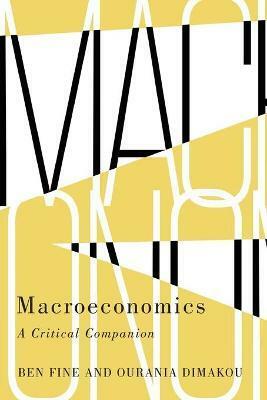 Macroeconomics is your guide to how economics shape how the world functions today. But too often our understanding is based on orthodox, dogmatic analysis. This distinctive book draws upon years of critical questioning and teaching and exposes how macroeconomic theory has evolved from its origins to its current impoverished and extreme state. Moving from the Keynesian Revolution to the Monetarist Counter-Revolution, through to New Classical Economics and New Consensus Macroeconomics, the authors both elaborate and question the methods and content of macroeconomic theory at a level appropriate for both undergraduate and postgraduate studies. Macroeconomics provides a unique alternative to the multitude of standard textbooks by locating macroeconomic theory in its own history. It will be perfect for those studying macroeconomics, as well as for those looking for a new way to understand our increasingly complicated economic system. It is accompanied by a counterpart Microeconomics: A Critical Companion. 2. Accelerator-Multiplier: Stabbing the Knife-Edge in the Back? 4. Growth Theories: Old, New or More of the Same? 7. Keynesian Revolution: What Keynes, What Revolution? Ben Fine is Professor of Economics at SOAS, University of London. He is the author of the critical texts, Macroeconomics and Microeconomics (Pluto, 2016), co-author of Marx's 'Capital' (Pluto, 2016) and co-editor of Beyond the Developmental State (Pluto, 2013). He was awarded both the Deutscher and Myrdal Prizes in 2009. Ourania Dimakou is Lecturer in Economics at the University of London's School of Oriental and African Studies. She specialises in macroeconomic theory, policy and institutional design, particularly the central bank independence paradigm.